Hey guys! I'm gonna deejay with my homeboy, Roland Cassard, Diamond Dealer on Thursday, March 18th at Tritone. We'll go from 10pm until they kick us out. And, it's free! We're calling it a Crucial Hang because you can bring your friends, sit around and have some drinks. It'll be chill. For those of you who have attended our dance parties at the Khyber, Mr. Cassard is the hot dude with the glasses who's deejayed the Brit-pop sets. He should really change his name to LL Cool C because ladies love cool Cassard. Haha! I'm gonna play Motown and '60s rock 'n' roll. He's gonna play whatever he feels like. Basically, our goal is to hang out and play the perfect jukebox soundtrack. Please come and hang out. It should be radical. Hate to miss it! Have fun, dudes!! Dude. 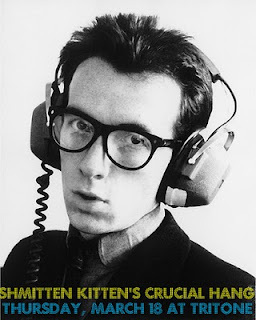 How is that not a photo of a young Elvis Costello? Killer headphones, too. That IS a photo of a young Elvis Costello! Isn't he dreamy?